5 Words: Friends, family, attraction, business, liveaboard.This little series is awesome.I love how the author tackles the fact that the main character lives on a narrow boat, how it's quite an insular community of rovers but still so friendly and welcoming.I love what happens because everyone knows each other, and you're pretty guaranteed that chaos of one sort or another is going to ensue.This installment is a little bit darker, and it feels like the storyline has taken a turn in a different direction. It's great to see Summer's confidence and independence growing! Off to the next book! Canal boatsIt would be a lovely way to live aboard a boat. A more secure system out in the middle of nowhere would be more sensible. To be completely honest, I skimmed this book. It feels very much like a bridge between plot points. I said in my review of the first book that it just stopped and I felt as though it was only about halfway through the plot, well this book feels like the missing chapters of that one, a short diversion to a new location, with some new characters, before resuming business as usual in Willowbeck.The newly introduced characters didn't really do much - there was some talk of Mason having a dark past, which Claire was hinting at, but this wasn't furthered in any way. Maybe it will be added to in book 3.Yes, despite being put of by the sudden end of the first book, and underwhelmed by the second, I have bought the third. It's hard to say what's driving my interest in the story. The protagonist is very bland, and the story not really interesting, but there is something underneath the disconnected plot points. I think that something is mostly about the protagonist's not-quite-friendzoned-friend. The whole book I was waiting for him to show up and cause conflict or drama, because the actual page-to page story wasn't very urgent - it was mostly about that main character idly debating whether she was going to go back to Willowbeck or not. BUT, when Captain Friendzone did reappear it was very interesting - mostly because I think it was him that trashed the café to get Summer to move back home. Just like I think it was him that told Valerie that Summer didn't believe in psychics. He seems obsessive and crazy, and that's interesting enough for me to keep reading for a confrontation. However, I still feel this could have been edited down into one book, two at the most, and it feels a bit choppy and underdeveloped in its current form. There's not enough conflict to make me want to keep reading, it's just my expectation of some kind of resolution that's keeping me going.The setting is interesting and the editing is of a good quality, the writing is serviceable, not terribly descriptive but doesn't distract from the plot. Argh! The struggle of serialised novels! I JUST WANT TO KNOW WHAT HAPPENS NEXT!! 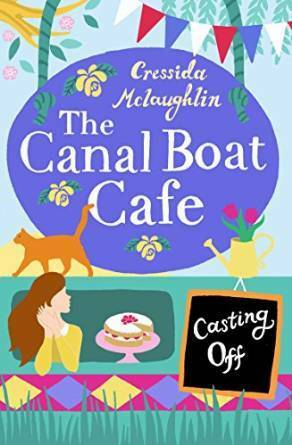 !I loved this second installment of The Canal Boat Cafe series. It took me a short while to try and work out who all the characters were again but after I'd managed that I was sucked straight back into Summer's world. Cressy writes so well and I loved that this section of the novel had so many elements to it. I am really intrigued to see what will happen in the next two installments and to watch how the relationship between Mason and Summer develops. Loved it! A funny readI read this book as an escape from things and I am now addicted to a set of lovable characters. The book set on a boat (would always want to do that) and revolves around characters where I certainly cared what happened to them and have been willing then to succeed. I can't wait to see what happens next. Part 2 of The Canal Boat Cafe series didn't disappoint! An easy readGood story line, once You start its hard to put down, characters are a mixture and can't wait for the next book. Great to catch up with life on the Canal Boat... having moved to a different mooring the cafe keeps busy. Really enjoy reading about Summer and Mason just wish the books were longer. .. Loved itGoing to read part three straight away! A very enjoyable read, looking forward to what happens next in this series. Lovely continuation of the story. Loved the shout out to the Monmouth Brecon canal! Throughly enjoyed this second instalment to the Canal Boat series. Good to meet up with Summer again - even if it did end on a slightly sad point. Can't wait to read the next instalment as the story seems to have taken a turn into the unknown past leaving me wanting to know more! Cressida McLaughlin - I was born in South East London surrounded by books and with a cat named after Lawrence of Arabia. I studied English Literature at the University of East Anglia and I live in Norwich with my husband David.My favourite things - other than writing - include terrifying ghost stories, lava lamps, romantic heroes and good coffee. I'm a huge fan of the BBC adaptation of Poldark and its leading man, Aidan Turner. I'm a total book nerd and my TBR pile is Out Of Control. When I'm not writing, I spend my spare time reading, returning to London or exploring the beautiful Norfolk coastline.